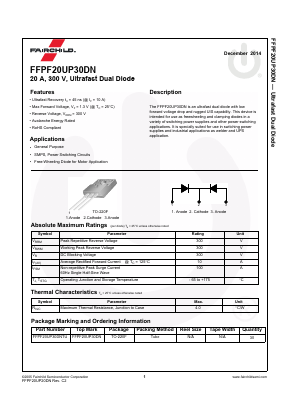 The FFPF20UP30DN is an ultrafast dual diode with low forward voltage drop and rugged UIS capability. This device is intended for use as freewheeling and clamping diodes in a variety of switching power supplies and other power switching applications. It is specially suited for use in switching power supplies and industrial applicationa as welder and UPS application. BYV32EB-200 Dual rugged ultrafast rectifier diode, 20 A, 200 V View NXP Semiconductors. BYV32E-200 Dual rugged ultrafast rectifier diode, 20 A, 200 V View NXP Semiconductors.